SACRAMENTO – California Gov. Jerry Brown signed the landmark Senate Bill 100 (SB 100) today, setting California on a path to generate 100 percent of its electricity from renewable and zero-carbon sources such as solar and wind by 2045. SACRAMENTO – California is shining a light on the future of energy. After a landmark vote by its state Assembly, California is poised to join Hawaii and become the second state committed to generating 100 percent of its electricity from renewable and zero-carbon sources. 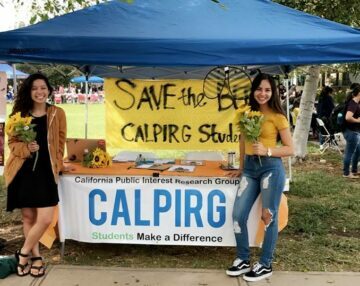 Sacramento – Motivated by a concern for the state’s environmental future and rollbacks at the federal level, 100 students from CALPIRG, the California Student Public Interest Research Group chapters converged in Sacramento for their Annual Lobby Day. 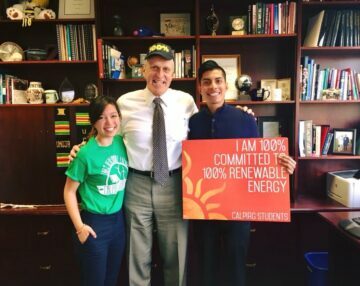 CALPIRG Students, a student activism group with a chapter at UC San Diego, has organized a huge week of action this week in support of 100% clean energy in California. 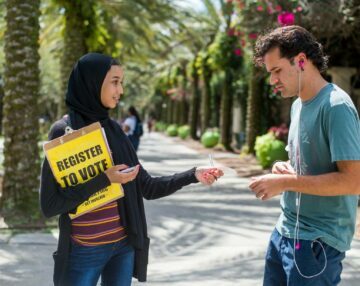 The week of action includes a massive petition drive to generate 5,000 petitions in support of clean energy legislation, a solar-powered concert featuring UCSD talent, and a Lobby Day in Sacramento with 100 students from across the state. We also attended a rally in Sacramento yesterday to speak out against offshore oil drilling at a meeting of the Ocean Energy Management Bureau. 100 student leaders from colleges across the state are urging the California State Assembly to pass SB 100 for 100% clean electricity by 2045. The students are leaders of a wide range of student organizations including student government, political and professional organizations, and cultural and social groups.